Double tees offer beauty and flexibility in design. These precast/prestressed concrete units are ideal for floor and roof systems requiring long, uninterrupted spans and extra heavy load carrying capabilities resulting in a lighter weight structures. For this reason, prestressed double tees are ideal. 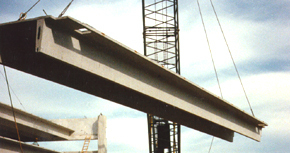 Prestressed concrete double tees allow for longer spans with shallower depths and thinner sections resulting in fewer beams and columns which provides the owner with more useable floor space. Durability and fire resistance means low insurance costs and greater personal safety. Those who investigate life-cycle costing will appreciate prestressed concrete double tees high fire resistance characteristic. 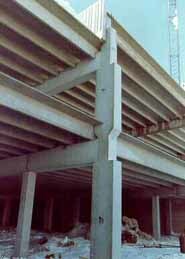 Prestressed concrete double tees can improve the thermal storage potential of a building. It effectively conserves energy required for heating and cooling. The remarkable strength of a double tee is the result of a design and manufacturing system that uses the best attributes of steel and concrete. Consider double tees for long spans and heavy loads which exceed the capacity of hollowcore plank. Double tees are known for their great resiliency. Long spans with exposed ceilings require no additional finishes. Superior smooth steel form finishes as well as excellent fire ratings are provided by double tee construction. Double tees can be designed to allow openings to be placed in the flange areas between the stems. This allows for the installation of electrical / mechanical ducts or windows/skylights. Typical building uses for double tees include parking decks, water/wastewater treatment plants, food processing plants, heavy industrial buildings, warehouses, indoor pools and gymnasiums. Strescon Limited can provide budget pricing and technical assistance at the preliminary design stage for your next project.